TANYA: By sharing at the feeling level we come to know each other in a more intimate way. After sharing at this level we feel closer, more united and in tune with each other. And sometimes we even feel empathy. BRAD: Because sharing feelings is so important, we’ll spend a few minutes talking about what feelings are and how to describe them. WHAT IS A FEELING? A feeling is a spontaneous inner reaction to a person, place or situation, and it’s neither right nor wrong in itself. An example of a time I felt happy was when Brad sent me coupons he had torn from the newspaper. He did it because he wanted to do something to help me save money. It was a pleased, contented feeling, knowing that he was trying to help. What really tickled me is that he even sent dog food coupons, and we don’t have a dog. A stronger happy feeling is the way I feel when Brad smiles when he greets me in the visiting room, his eyes filled with admiration. Then he gives me a kiss. Suddenly the whole room looks bright and rosy, and I feel light as air. An even stronger happy feeling is when Brad told me that when he gets out of prison he wants us to renew our marriage vows in the church I now attend. He said he wanted everyone, especially God, to know he loves me and will cherish me forever. I became overwhelmed with joy, so much so I started to cry. It was a blessed feeling. I felt a warm glow come over me and my heart seemed to be singing. You’ll notice that in each example I felt happy, but my feelings inside weren’t always the same. That’s why it helps to describe our feelings. An example of feeling sad is how I felt missing my sister’s graduation. It was disappointing, but pretty low on the scale, at most a 2 if 10 is the highest degree of sadness. A stronger feeling came after a disagreement and Tanya avoided eye contact and wouldn’t talk. I felt sad, but in this case it was a heavy, blue feeling, like when I lose something important to me. A stronger feeling of sad was the ache I felt when our daughter Elisa was a newborn baby and needed surgery. I was all choked up and tears welled in my eyes. She looked so pitiful, my whole insides ached for her. I could also see the pain in Tanya’s eyes and that left me feeling very sad. Again, in each case I felt sad, but each time the experience had a different meaning and intensity for me. I felt frightened about five years ago when I flew on an airplane for the first time. It wasn’t too strong a feeling because Brad was with me, and we were going to visit my family. However, I was also worried about how they’d accept Brad, meeting him for the first time. I remember the nervous feeling, but it’s hard to remember what I was most worried about. My feeling was about a 3 on a scale of 1 – 10. I was much more frightened when I first came to visit Brad at the FCI. I didn’t know what to expect, and no one could tell me. Brad tried to explain but I thought he minimized the awful stuff to keep me from worrying too much. I felt very anxious, tense, and alone. The worst fear I experienced was when our daughter was born prematurely. I was terribly frightened, more like a #10 on the scale. I felt helpless, like seeing her struggling in deep water and not being able to swim. I could hardly breath, I was so scared. An example of feeling angry was one of the times Tanya wasn’t home when I called. I was angry because I had waited in line for over an hour and she should have expected my call. But I learned not to get too angry until I at least find our what happened. Usually it’s just a mild anger, an irritation, but enough that I couldn’t just ignore it. A stronger feeling of anger is when Tanya cuts me off when I’m talking. That is about 6 on the scale. If she talks to someone else, I feel like I’m not important to her. It’s an ignored, degrading type of feeling. One of my all time feelings of anger came when Tanya wrote to me and said she sold my motorcycle. What a shock! I didn’t have a clue that she was even thinking about selling it. My feeling of anger hit the top of the scale that day. I had so much anger build up inside of me, I felt like a volcano about to erupt. My words were like hot lava spilling out of me. I’m glad she wasn’t around. I really didn’t know how to handle it. 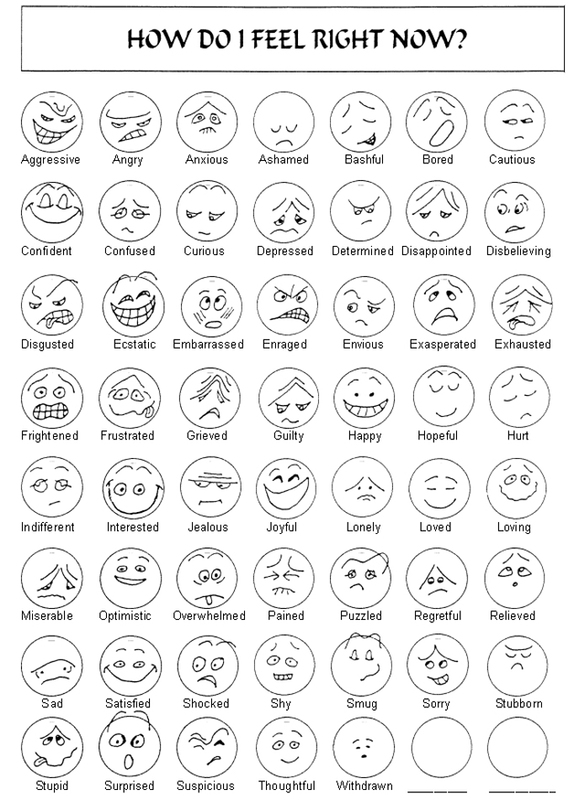 Following are a lot of faces that illustrate the different feelings we might experience. 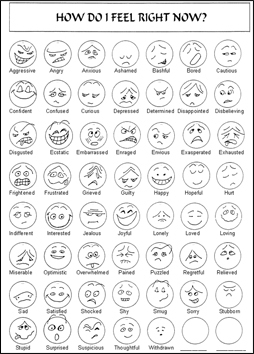 Look for the faces that best describe how you feel right now. You may relate to many of them. Then we have four circles. 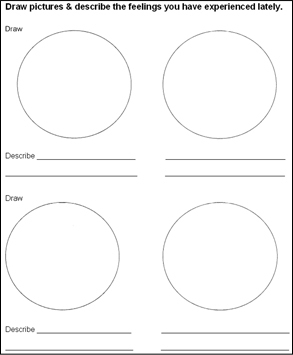 Draw your own circles, and in them you are asked to draw and describe faces that illustrate feelings you have experienced lately. Have you been able to express these feelings to your spouse? To anyone? How do you feel about that?